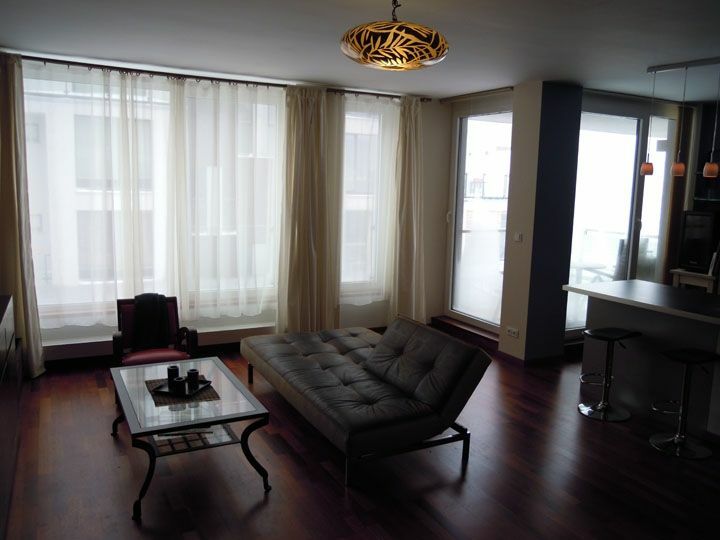 I'm offering a studio flat in a new complex in Vinohrady. The complex site and further info can be seen by searching Rezidence Riegrovy Sady. This is a 54m/sq (or 600 sq/ft) 3rd floor studio apartment with a stunning westerly view of the city. From a small private terrace you can watch the sun set nightly over Prague Castle. There is a washer and dryer in the apartment, a full bathroom, and a queen size Murphy bed that folds into a wardrobe if you want more space to entertain. High speed wireless internet, flat screen TV (Local channels plus HBO, BBC, CNN etc.) DVD player, and iPod dock/player are all included. The furnishings are modern and high quality. The couch can lay flat and act as full bed to accommodate a visiting friend. The floors are hard wood and the kitchen is fully equipped with an electric stove with stainless hood, oven and microwave, fridge, 18 bottle wine cooler, espresso machine, electric kettle and bar/counter that serves as a table/serving area. There is an elevator and 24hr on site security. I'm a neat, responsible, and respectful person that enjoys traveling and exploring - I work to travel. Currently I'm working on a project that will keep me rather grounded for the next year or so. So just let me know when you're looking to go to Prague and hopefully my flat will be available for you to enjoy. This is my European Pied-à-terre. I fell in love with Prague some 10 plus years ago and have traveled back for months at a time every year. This is an excellent location to explore Prague, the Czech Republic and all of Europe. I chose the Vinohrady neighborhood and this particular property because of its location. It is walking distance to Prague's most important and interesting locations. A short list would include Riegrovy Sady Park, the main train station, Old Town Square, namesti Miru, many of the city's best restaurants, and the discussion provoking Zizkov TV tower. The property also has a beautiful terrace view of Prague Castle. It is close enough to the center to walk to all the main attractions but removed enough so that you aren't living in an area inundated by tourists and all things tourism. The neighborhood (Vinohrady) is considered one of the best and safest in the city. Czech TV, HBO, Cinemax, ESPN, AXN, Nat Geo, BBC, CNN, etc. Various - Travelers Library - Take one/leave one. There is an elevator to the flat. No bath or toilet handrails.